The Adobe Digital Marketing Symposium is an annual event where Adobe showcases their marketing cloud products and client cases. The event is organised in a few locations around the world. The Singapore and Sydney editions are just behind us and here is what we learned. In case you hadn’t noticed yet, Adobe has left the pdf, Photoshop and InDesign phase a long time ago. These and other famous graphical products are now grouped into the Creative Cloud. 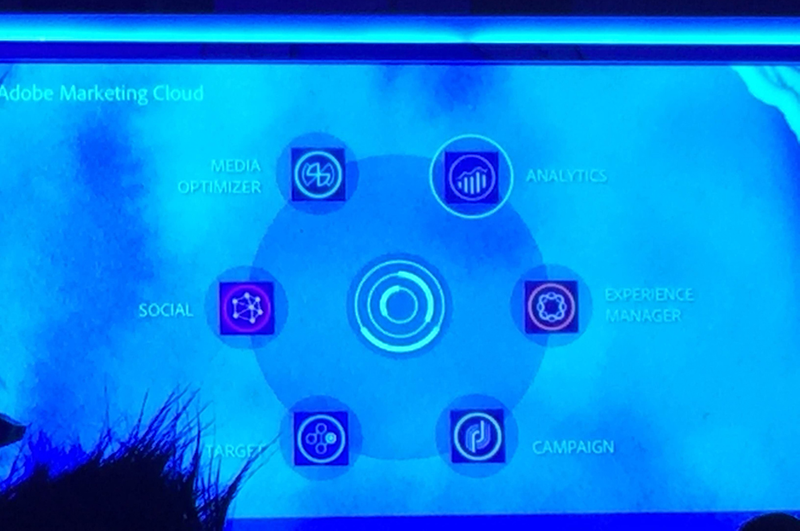 But 5 years ago they envisioned a true marketing cloud, featuring solutions for the management of campaign, data, segmentations, analytics, social and the customer experience. After a few acquisitions and a tremendous amount of effort to unify the various platforms and solutions, this year’s conference definitely showed that they are onto something. The UI and the integration of the various parts of their cloud are maturing and are starting to deliver. In addition they just announced the document cloud as well. This suite of solutions is not only aimed at digital but is suitable for the management of printed matter as well. Adobe is a tech company, even though many would think they are creative because of the Photoshop heritage. But for a tech company they have very well understood that the user interface needs to be easy and accessible from everywhere and usable for anyone. Coping with a lack of data scientists and analysts was used as an example of why this is so important. Adobe suggests that solutions are easy to use people that have a drive to learn to be an analyst can actually achieve results, without being fully academically trained. The focus on usability is definitely where Adobe is beginning to have an edge over other platforms and solutions. The accessibility is also further enhanced through mobile apps and interfaces and through their recently introduced Document Cloud. Without client references, a conference like this would be basically just a selfish almost narcissistic event. So it is rather good to see clients and users on stage presenting what you can achieve with the Adobe cloud solutions. The likes of DBS, Malaysia Airlines, Rakuten, Unilever, Starwood and Nestle presented interesting cases, showing how they put the technology to work. The most often heard buzz words in one phrase was definitely something like: marketing is about delivering data-driven, real time, relevant customer experiences and with Adobe’s Marketing Cloud this is becoming reality. Although you hear this a lot at every marketing and data conference, it is true that today there is no longer any excuse for any company not to use data for marketing. Secondly, you can do omnichannel marketing in real time today. 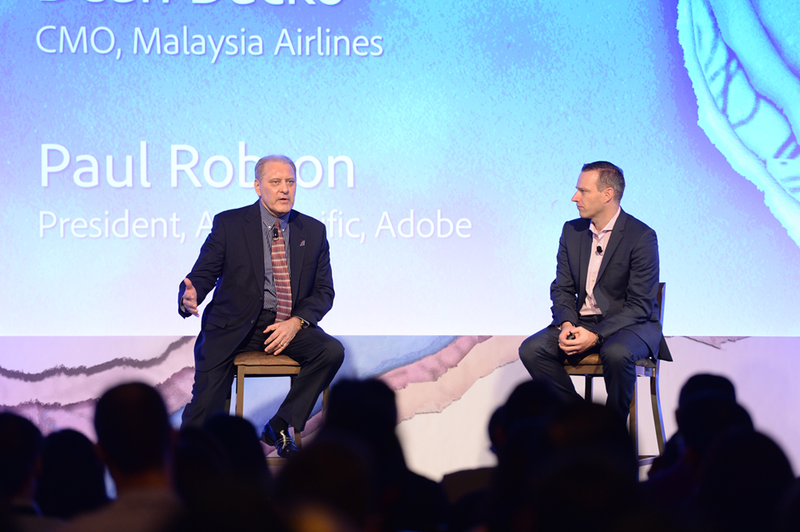 Dean Dacko, CMO, Malaysia Airlines (left) and Paul Robson, President, Adobe Asia Pacific. Technically everything is already possible and it enables so many tactics that marketers might feel overwhelmed at first. The biggest hurdle now is developing relevant content and doing that in a meaningful and effective way. It is there where the flamboyant Robert Rose delivered an excellent closing keynote on the 7th Era of Marketing. The way he made it clear that silo’s need to disappear, that content strategy should not be about complex but should be based on a simplified user journey. He explained in a very animated way how marketing should really be about creating remarkable experiences and his keynote resonated well with the audience. Next year we will definitely visit and report on the next edition of this symposium again. We’re curious to see where Adobe will be at that point on their marketing cloud journey.